A former Guantanamo Bay prison guard and Marine explained in details what makes him believe three problematic detainees were killed at CIA black site in Guantanomo and their death was covered up as a triple suicide. Army Staff Sergeant Joseph Hickman was on duty at the notorious prison camp when the three men died, and insists the official version of events is “impossible,” he toldVice News. The three men were Salah Ahmed Al-Salami, 37, from Yemen, Mani Shaman Al-Utaybi, 30, from Saudi Arabia, and Yasser Talal Al-Zahrani, 22, also from Saudi Arabia. None of them had been charged with any crime. He explained in an incendiary interview with Vice News that the three men would have had to have committed suicide at exactly the same time in a cellblock where guards check on detainees every four minutes. “They would have had to all three tie their hands and feet together, shove rags down their throats, put a mask over their face, made a noose, hung it from the ceiling on the side of the cellblock, jumped into the noose and hung themselves simultaneously,” he said. Hickman added that an inspection of the detainees’ cells just a few hours before they supposedly killed themselves revealed nothing that they might have used to kill themselves – such as nooses, rags, or shoelaces. The former Marine, who first joined up in 1985 and for a while was in a unit attached to the NSA, has been trying to put the nightmare of working at Camp Delta behind him. But when he saw on TV that another inmate had hung himself, he decided to face up to what he had witnessed. He has written a book, 'Murder at Camp Delta,' which he hopes will eventually lead to the truth. Hickman was careful not to name any of the alleged murderers by name in the book, but he still hopes it may trigger a proper investigation into what really happened that night. “I can’t name names. I keep it vague at the end for that reason. I say it was murder, this is the reason why,” he said. On June 9, 2006, Hickman was on guard duty at Camp Delta when he saw a paddy wagon arrive at the high security Alpha Block three times – each time picking up a prisoner and taking them out of the camp. After this, between 11:00 p.m. and 11:30 p.m., the paddy wagon came back to Camp Delta – but instead of going to Camp I, it went straight to the medical detainee clinic. “About 10 minutes later, all the lights come on, like a stadium, and sirens are going off — it’s chaos,” he said. All three detainees were dead. Hickman believes he knows why the authorities at Guantanamo would have wanted to get rid of the three men. The three men were regular hunger strikers who incited other detainees to do the same – and when prisoners were on hunger strike, it was camp policy said they couldn’t be interrogated. “They had a policy that if a detainee is hunger-striking, he cannot be interrogated. In 2006, they were doing roughly 200 interrogations a week, so any massive hunger-strike would, what they consider, cripple the intelligence value. I believe the number-one mission in JTF-GTMO (Joint Task Force Guantanamo) at the time was, stop the hunger strikes at all costs,” said Hickman. The ex-sergeant said that after the deaths, there were no hunger strikes for a long time. Hickman first approached the US Department of Justice in 2009. His claims and those of others at the camp were reported in Harper’s magazine in 2010. The authorities issued a hasty denial, claiming that Hickman was stationed outside the perimeter and wouldn’t have been able to see the entrance to Alpha Block. 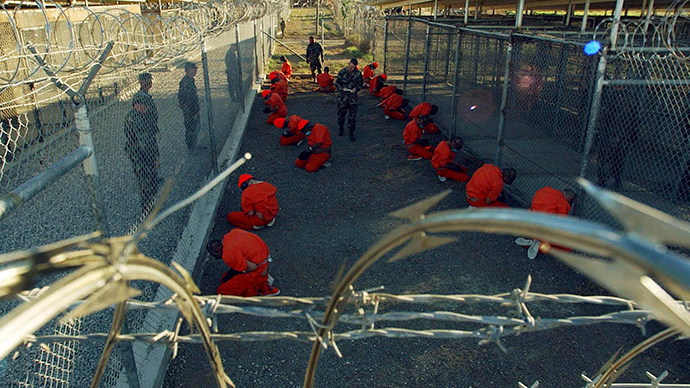 Since then, the truth of what went on at Guantanamo has begun to trickle out. A recent Senate report – which the CIA tried to repress – found that the CIA regularly used torture, violence, and degrading treatment in its interrogation techniques. The report also claims those tactics rarely produced any decent intelligence. But just after the supposed triple suicide, Rear Admiral Harry Harris attacked the three detinees for daring to take their own lives. “They are smart. They are creative. They are committed. They have no regard for life, either ours or their own I believe this was not an act of desperation, but an act of asymmetrical warfare waged against us,” Democracy Now quoted him as saying. Hickman’s interview comes just days after Republican senators proposed that a moratorium should be placed on the release of all medium- and high-risk detainees, citing danger to the US and its allies, adding that any transfers to Yemen should be barred for two years.